Trippin' it old school style is Sweden's Grand Magus, back with their sixth album The Hunt. Check out the photo below. 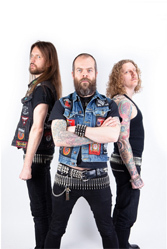 If their garb doesn't convince you that this trio is groovin' classic heavy metal, then their music will. Grand Magus: we is metal. This is classic melodic heavy metal ala early Eighties, pure and simple. No frills, no excess, just straight up metal with a big groove, rumbling rhythm section, and tasty guitar solos. Of course, you can all so expect themes of myth and legend, warriors and battles. With this and a little more speed, The Hunt could near power metal, and Iron Hand comes close. 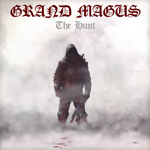 With their metal well imagined and played, Grand Magus delivers a solid platter of songs on The Hunt. Yet the best are those that have an epic feeling, namely Sword of the Ocean, Valhalla Rising, and the mighty Son of the Last Breath. This latter song opens with rich section of acoustic guitar only to return to a rising, sometimes foreboding, crescendo. It ends with the acoustic guitar, then quickly shifts to the speedy metal of Iron Hand. Quite nice. For the old school metal style made relevant for today, you can't lose with Grand Magus. The Hunt is another fine platter of classic heavy metal. Another confirmation that true metal remains strong and well represented. Very recommended. For the old school metal style made relevant for today, you can't lose with Grand Magus. The Hunt is another fine platter of classic heavy metal. Very recommended.